Please share widely throughout Oaxaca. Naeim Rahmani is an Iranian classical guitarist who recently graduated with a Master’s degree in classical guitar performance from the University of Wisconsin at Milwaukee, where he studied with renowned guitarist Rene Izquierdo. He is an active performer and performs regularly throughout the United States and around the world. In the summer of 2014, Naeim performed a series of concerts in the north of Spain along the route of the Camino Santiago. Camino Artes sponsored the concerts, all held in local cathedrals. The organization was created by Mexican luthier Federico Sheppard and supported by the town of Carrión de los Condes. Most recently Naeim was a prizewinner in several competitions, including the 2015 Northwest Guitar Festival and Competition, the 2015 San Francisco Bay Guitar Competition and the 2015 University of Louisville Guitar Festival and Competition. His program is mostly classical music. Naeim contacted me to help him secure performance venues in Oaxaca just before I left for California to be with our mom at end of life. Music has always been an important part of our mother’s legacy, so I was happy to help. I put the word out and gratefully, Maria Crespo, owner of El Diablo y La Sandia B&B generously offered to host this concert. No reservations necessary. First come, first seated. Space limited. This will be his only concert in Oaxaca this year! Please come and support him. She is ours — Oaxaca’s goddess of song and lyrics. 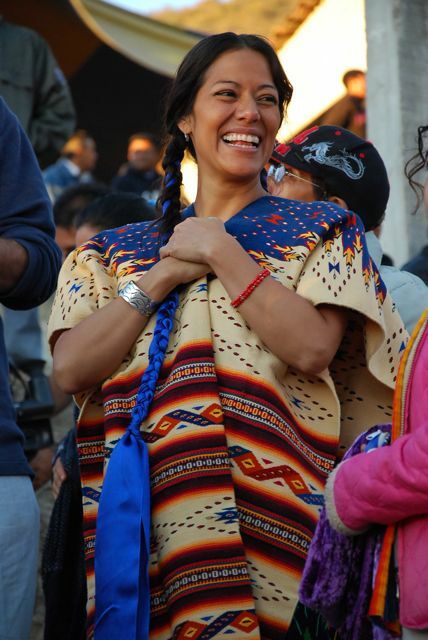 Lila Downs went on stage to perform at the 13th Latin Grammy Awards on November 15, again recognized for what she has contributed to the music world. The Examiner article says it all. Accolades, too, to Paul Cohen, Lila’s husband, producer and collaborator. Here are two photos I’ve taken of Lila in recent years. Enjoy. 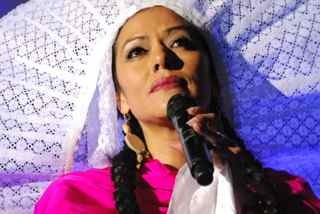 Above: At her Day of the Dead concert in 2011 at the Guelaguetza Auditorium in Oaxaca. Below: At Las Cuevitas chapel, January 2 in Teotitlan del Valle, Oaxaca. The poncho was woven by Erasto “Tito” Mendoza in the Saltillo style. The hot band Toto la Momposina (click on this link to hear their great music) from Colombia, South America, opened for Lila Downs last night at the Auditorio Guelaguetza in Oaxaca. Lead singer Sonia Bazanta Vides, who has been dazzling audiences with her voice for over 50 years, announced this was her last concert (if I understood correctly). Front row seats meant a ringside treat to the dancing, hip swaying, and throb of the bass from the speakers. The beat was definitely cumbia, salsa, tango and with Afro-Caribbean drum accompaniments. Totally a hand-clapping, toe tapping experience. Exuberant and joyful. Sonia’s voice was only equal to the energetic dancing by the performer in the bright floral blue, yellow and red dress. Both offered visual insight into the music and dance traditions of Colombia. Plus, the band included African and indigenous instruments — flutes, drums, and rattles — that added spice to the performance along with the electric guitars. Nominated for a Latin Grammy, Sonia Bazanta Vides has performed for over 50 years throughout the world, representing the rich and complex music of Colombia and especially the islands where she was raised. She studied music, voice and composition at the Universidad de Colombia and at the Sorbonne in Paris. In 1983, she accompanied Gabriel Garcia Marquez to accept the Nobel Prize in Literature. As soon as I heard that Lila Downs was performing in Oaxaca, I ordered two (muy facile), never imagining that I would end up in front row on the rail right next to the stage. Que milagro! Though my bags were checked at the gate, I managed to smuggle in my camera. All the signs said no cameras allowed. Fortunately, la prensa (the press) were seated right next to us with mega lenses in hand and I was able to easily blend in. Que milagro! Lila is an incredible performer and vocalist. She is also socially responsible and committed to her Oaxaca and Mixteca origins. It was a wonderful concert. The entire Guelaguetza stadium was packed and the energy was electric. Color strobe lights changed the atmosphere from yellow and red to blue and green and all hues in between. A “smoke” machine created stage mystery. Lila added shawls, a hat, and a Tito Mendoza woven tapestry poncho to her repertoire as she interpreted each song. She really knows how to connect with Oaxaca and her people. I took over 450 photos and wore down my battery. A photo extravanganza for sure. The audience was enthralled. There are many foreigners in the city now to enjoy Dias de los Muertos. The stands were sprinkled with extranjeros. And the band played on! Even with my long lens the environment was challenging. Her white dress. Constantly changing colors and movement. Being a novice shooter. I didn’t have my tripod and camera shake without it is predictable. Even though I balanced the camera on the rail to provide stability, you can see that many of my shots are imperfect. I was just grateful to be this close and personal. Here you will experience the magic and mystery of Day of the Dead as celebrated in Xoxocotlan, Oaxaca, Mexico! Enjoy, compliments of Nick.